Numovil's proprietary blend of premium ingredients includes vitamins C, E, and B12, along with ginkgo biloba. These natural substances can actually help improve brain circulation, increase the supply of oxygen and nutrients to the brain, and help eliminate free radicals. Some degree of memory loss may be a natural part of the aging process. As we grow older, we may find it more difficult to remember phone numbers, birthdays, or names. There may be many factors contributing to this decline in memory function, including improper nutrition and/or poor lifestyle choices. The brain is nourished by blood. Toxic elements such as dietary toxins, environmental pollutants, tobacco, and other foreign substances may negatively impact normal brain function over time. Now there's a lifestyle choice that just may have a positive impact on your brains healthy function. 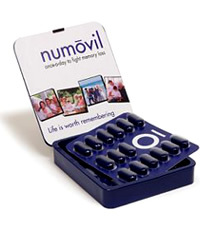 It's called Numovil, and it was designed for ordinary people who want to give their brains a healthy boost. A program of sensible nutrition and exercise, in conjunction with Numovil, can help slow down the progression of memory decline by enhancing the level of neurotransmitters and improving blood flow to the brain. Regular physical activity can improve circulation vital to the nourishment of your brain. It's one step you can take to help keep your brain in top form. Numovil is another. Numovil also contains folate—important for making new red blood cells—and thiamin, which plays an important role in maintaining a healthy nervous system. Taking it each day is a natural way to help ensure that your brain gets the nourishment it needs for healthy memory function. It’s a small step, but the results can be memorable. Once-a-day to fight memory decline, Order Now!